Just in case you left something in your last ride, here’s a quick way to contact your driver. 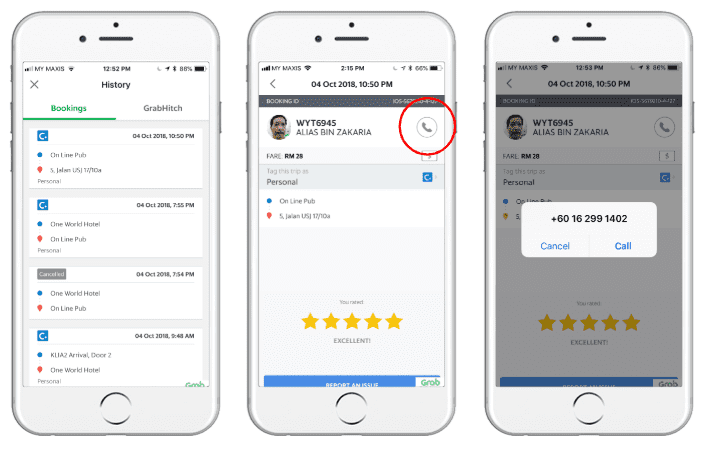 Passenger must call from the same phone number that they registered on the Grab app. Driver will also be receiving the call using the same phone number that they registered with Grab. Standard network call charges apply. The caller and recipient will both see a standard local number. The call will be made via a “virtual number” in compliance with Data Privacy. This number will work only for the duration defined above. Since you can only call the driver via the same phone number that you’ve registered with Grab, this feature (for the time being) does not resolve for lost handphones. As such, lost phones must be reported to our Help Centre for immediate resolution.